Ridiculing someone over your headset is one thing, but jabbing someone in the gut for bragging about their latest win is so much more gratifying. There’s something about playing a game on the couch with a bunch of buddies that a wireless connection can’t replicate--the laughs, the tears, the awkward confessions of love. And if a game offers such dynamism, customization, and simplistic hilarity as TowerFall Ascension, you’re in for a good time. So if you have those friends (and controllers handy), TowerFall is that party game your living room’s been waiting for. TowerFall’s greatest quality is how easy it is to pick up and play. Each match lets up to four archers duke it out on a single-screen 2D stage where you’ll need to be quick on your feet and shoot down your enemies before getting shot down. One shot is all you need for the round to be over, and because you can have up to four players in one small stage, matches are bound to get pleasantly chaotic and quite dicey. You only start out with a small number of arrows too, so you need to be crafty and pick them off corpses, walls, or bump into enemies to reload your quiver. A dash button lets you evade enemy fire, but timing it correctly means catching an arrow in mid-air. Rounds can be over in seconds, but in the hands of skilled players, they become tense stand-offs that put all your skills and accuracy to the test. In fact, it’s the moments when you do run out of arrows that TowerFall shows off an impressive level of depth and strategy underneath its 16-bit veneer. For instance, having an empty quiver means you’ll need to steal arrows from someone else, wait for treasure chests to spawn more, or risk jumping onto your foes' heads to take them out. It's easy to move around the stage and evade danger when a match turns into a game of cat-and-mouse, but one wrong move usually means getting shot through the head or squished from above. Jumping into pits or running toward one end of the screen will just have you reappear on the opposite side, making things even more chaotic while providing additional ways for you or your enemies to plan an assault. The best part of all of this archery madness is that you can set how matches play out by customizing and saving various options to your liking. How about making it so there are no arrows at all? Or what about causing players to explode after you hit them? Or maybe you’d like some power-ups such as exploding arrows, drill bits, or a pair of wings for added mobility? These tweaks let you turn TowerFall into an even more competitive experience, or into the next hilarious party game your friends will be talking about for days. Of course, all this talk about parties means TowerFall is best played with other people in the living room. You can’t play versus mode against the computer, and there isn’t any online multiplayer either. Even having one or two extra people isn’t the most optimal way to play, as matches are a lot more exciting when four archers are romping around in tight quarters. If you're planning on picking this up (which you should), do so knowing you'll need to either perfect the art of self-cloning, or have a few buddies willing and ready to play. 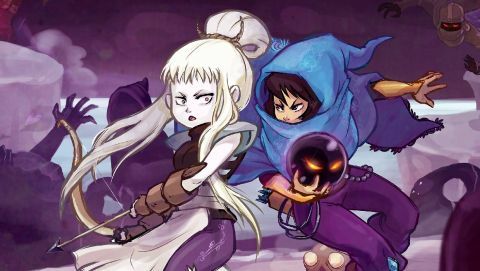 TowerFall does come with two additional single-player modes that are great on their own, but they only serve to give players a sampling of how much fun they could be having if they had others to play with. Trials mode, for example, gives you targets to shoot down as fast as possible and introduces power-ups you’ll use in versus matches. Quest mode challenges you to survive waves of enemies and even includes a tough boss battle to culminate the journey. The inclusion of online leaderboards would've at least provided incentive to continually improve, but as it stands, you'll compete against only yourself the whole time. TowerFall Ascension is one of those games that rewards you for sharing it with your friends. But instead of group hugs and chummy laughter, everyone will experience moments of intense panic, satisfying victory, and shots to the head that can be as competitive or as lighthearted as you want. Its single-player modes are limiting, but they’re great ways to kill time until your friends drag themselves over to your place. They’ll soon find out it was well worth the trip. Description Play against friends or A.I. in this all out 2D pixelated archery game.